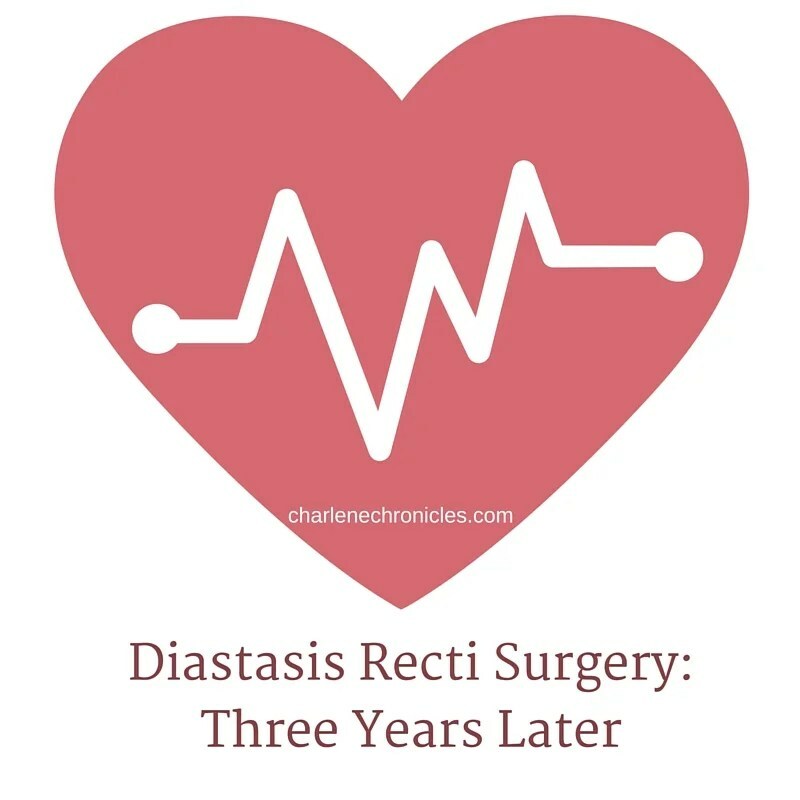 It has been on my mind for awhile to write this post as many of you, when you stumble upon my blog about my Diastasis Recti diagnosis, my subsequent Diastasis Recti surgery, and my Distasis Recti recovery, then wonder how I am doing now? Well, it has been three years since my surgery and I am doing great. It took a good year to feel like I could walk upright to give my tight muscles a chance to stretch and not have the fear that I was going to pull something or rip something open and ruin my recovery and surgical results. Once that first year passed, it has been almost something I forget about on a daily basis. I still have some numbness in areas, which is a risk that is explained as part of the surgery. It is not a bad thing in my case. Just strange when someone touches me there and I feel it, but don’t feel it. It is rather hard to explain but something that is okay by me, all things considered (and makes bikini waxing more doable!) The area is not as tight as it was, and has relaxed in the three years so I have more of a natural appearance, which is a good thing – though I do somewhat miss that washboard ab look! LOL. The Diastasis Recti surgery scar is probably the one thing that I wish wasn’t there. But I didn’t ever plan on wearing bikinis to the beach so it is one of the many things that just is something that is and shows the signs of our aging life! For our family, it was worth the sacrifices (recovery and funds) to do it as it. It helped me be able to be active and happy for my kids. As you know the saying, “happy wife, happy life” (or “happy mom” in this case), it did a lot for my mental strength in being active. I guess the one regret is that I wish I had waited maybe one year more. It would have been hard, mentally, to endure they questions and comments. So to be honest, I am not sure if I could have waited. But by waiting, you can ensure that you are done having kids, save more money, and let your body recover more from the pregnancy, before delving into surgery. So that said, my personal advice would be, in retrospect, is to give yourself at least 12 months after having your last baby to go down this road of inquiry and potential correction. Most physicians won’t operate before six months anyway, as they want to see what your body can do on its own in its post-pregnancy recovery. (There are lots of studies out there that shows it takes up to a year for a woman to recover physically and hormonally from pregnancy.) Then after the 12 months, you (and they) will know what you are facing physically. A lot of you email me to share your stories and it means so much to me, as I wasn’t sure about sharing personal story to the masses! But I wanted to connect with you all to show that this is a real issue and you are not alone! I wish I could answer everyone of you back though. It is a lot easier if you leave a comment on the blog, as I can quickly write back in that way (rather than your email getting lost in the jungle that is my email box!) Plus, if everyone leaves a comment (you can be anonymous) with a question or their story, it can help everyone else who reads these posts. Let’s all support one another in our journeys! Thank you so much for sharing your story. I’m currently considering this procedure after having my three kids in 3.5 years. I don’t have any hernias, but I have a large separation so reading your experience is very helpful. It’s very hard to find very much information about extensive abdominal reconstruction, I put your link at the end of my post. Hugs back! Hello, I had diastasis recti repair surgery/TT almost 11 months ago. my stomach is very crooked. one side is a lot bigger than the other. I weigh 15-20 lbs more than before the surgery. My legs and feet are also swollen. Can you tell me when all your swelling was gone? Thanks for the info. My swelling took up to two years. Always good to check in with your doctor though!